Mrfranswa made a very inspiring Resident Evil map for Sven Coop with a lot of cutscenes, puzzles and objectives throughout the level. 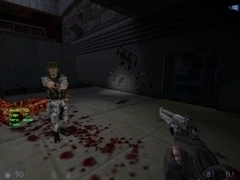 The levels includes new textures, weapons, music, sounds and enemies each sticking to the Resident Evil theme. Anyone who is a Resident Evil fan, I recommend you to play it. 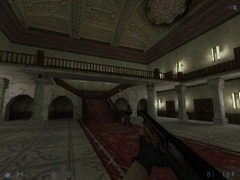 The gameplay is the heart of this map, the gameplay makes this map feel like a real Resident Evil game. With the item pickings, to the zombies and then the puzzles which have all been used very well. 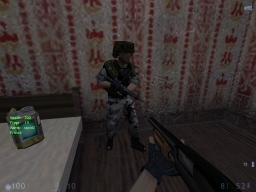 Although some monsters can tend to use up a lot of ammo, like the Zombies, they were never that strong in the game. There are a lot of puzzles in this map from, ones we see in the Resident Evil game and some of his own ideas, such as the lockpick or breaking the glass and turning the valve. Another great thing about this map is the amount of teamwork you can use. I played this map with my friend Shane a.k.a rapidZ, and we had a lot of fun and used a lot of teamwork. We would keep guard of areas for others, open doors when needing to push something through, distracting bigger monsters, and finding locations we’ve not seen before and sharing the weapons and ammo fairly. Most of the monster placements are random, but some are placed and won’t appear there again, but most do. As you progress through the map, harder to kill monsters appear more often (like the lickers and hunters) and sometimes get annoying when trying to get to something fast. The map also has a varity of boss battles, from Maithus to giant crocodiles and giant sharks, and the odd mini-bosses here and there such as rusty-heads. But the monster balance can also vary depending on what skill you chose at the start of the map. Music in the map is taken from Resident Evil 2 and Resident Evil Remake, but used well. The way the music is used in some parts of exploring is used well and adds to the creepiness. Boss battle music is okay, but can get repeatability and low quality. Sounds are good for the zombies since they are Resident Evil rips and work well to add the atmosphere that its a Resident Evil environment. The map has a lot of them, but im not surprised due to the size and many entities used. These bugs are from doors going missing, doors floating away, zombies getting stuck, zombies not falling when dead, the main boss getting stuck in the corridor. Theres also another bug, if you don’t kill the first licker you see, it will never attack you, and when fighting enemies on stairs (Shane found this bug) they wont attack you and easily killed by the knife, also the handgun somewhat has the “unlimited ammo but no damage bug” which is weird and you will get it.